ATLANTA — Aperia Technologies Inc. announced the rollout of Halo Connect, a connectivity platform that marks a shift to predictive tire maintenance. Aperia made its announcement March 18 during American Trucking Associations’ 2019 Technology & Maintenance Council annual meeting here. The platform categorizes tire-related issues by severity and provides maintenance recommendations, enabling fleets to prevent tire failure due to leaks and underinflation by streamlining communication and tire maintenance, according to the Burlingame, Calif.-based company. The algorithms were “trained” over more than half a decade and nearly a billion miles in pilot programs involving dozens of fleets. 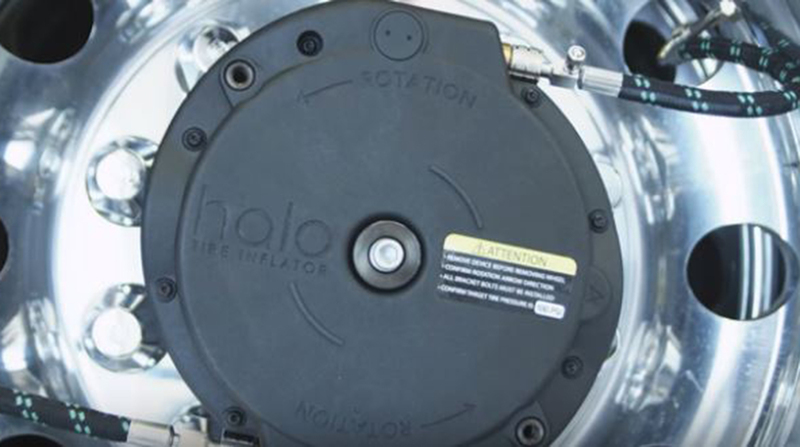 Halo Connect is available for use on vehicles equipped with the Halo Tire Inflator, an automatic tire inflation system for trucks and trailers that bolts on in minutes. “We are now in a connected era with more and more fleets embracing this new age of predictive maintenance, and tires are a place where a fleet can find real tangible traction on the quest for a safer, more efficient and more profitable fleet,” Aperia CEO Josh Carter said in a release. “There is more context that we can pull in to make thoughtful recommendations rather than just triggering a bunch of alerts and inundating the fleet,” Carter later told Transport Topics. The company has begun shipping limited quantities of Halo Connect to select fleets, with production quantities scheduled for the fall. One executive with a provider of emergency roadside service welcomed the predictive approach. Asked if Aperia had peaked with Halo Connect, Carter said it is just the beginning, and a good product strategy needs to take into consideration what the customer is ready for. The core Halo automatic tire inflation product was needed to build the company’s brand “and show customers, when we deliver a product, it works. That was just the foundation,” he said. “The Halo Connect is something we have been thinking about and planning for a very long time,” Carter added. Aperia has a broad vision for how it can affect the relationship between a fleet and its tire program, he said. “But if you were to go and do something really out there in the world of tires, there’s no guarantee the industry is going to be ready for that,” Carter said. “As far as the other aspirations we have, we’ll save that for another day.